*The price is an estimate, an exact price will be given on the engineers initial inspection. 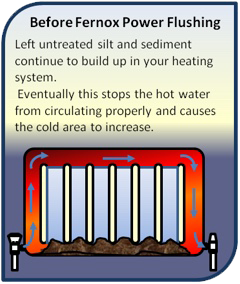 Why should you have a Powerflush? A PowerFlush is a cleansing proccess which aims to remove deposits of sludge, rust and any other debris from your central eating system. These contaminants, if left, can seriously affect the efficiency of a heating system. It is also recommended that the PowerFlush process is carried out if you intend to connect a new boiler replacement to an old heating system. This is because most new boilers are condensing boilers and any contaminants already present in the heating system can quickly damage the internal pipe work of the new boiler. The overall aim of a PowerFlush is to restore full circulation of water around the central heating system, however, it can also eliminate noise from the boiler and the pump as well. This means that the entire system has to be flushed in order to get the best results. 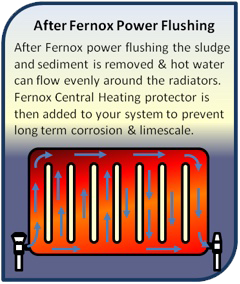 The result of PowerFlushing is that the boiler and the rest of the central heating system become more efficient. This occurs because there is better circulation through the pipe work and the radiators and in turn the boiler doesn't have to work as hard to warm the house or water. Therefore, the overall result is that you save money on your gas bills. A heating engineer will connect a powerful high flow/ low pressure pumping unit to the central heating system - either to the circulation pump in regular boiler systems or the pump head in combination boilers - and with the help of high strength cleansing chemicals - will flush out anything in the system. The chemicals used during a PowerFlush include a sludge crust breaker and remover to help get rid of rust and sludge, a descaler to break down limescale and a corrosion inhibitor to stop further rusting from occurring. A-Rated PowerFlush states that a full PowerFlush will take around 7 hours to complete. This is an estimate though as some badly affected heating systems will require more time, whilst others may be finished quicker. The cost of a PowerFlush includes all the chemicals and a certificate for your boiler manufacturer/insurance. The PowerFlush certificate is issued to you and for your boiler manufacturer, without the certificate your boiler warranty might be void. It is important that your central heating system is as efficient as it can be at all times and although a PowerFlush can be an expensive process, it can also save a lot of money over time with regards to your heating bills. The process is clean and safe when completed by A-Rated PowerFlush and can quickly eliminate cold radiators and noisy boilers or pumps. A-Rated PowerFlush is supported by the Prince's Trust and has ben since the very beginning. We cover the whole of Yorkshire and are based in Wakefield. At A-Rated PowerFlush, you are the most important part of the business, which is why we always offer a high level of customer service. A-Rated PowerFlush find great satisfaction in problem solving and making our customer’s houses a warmer and more efficient place to live. We only offer the best in power flushing, there is no ‘Economy Flush’ or ‘Standard Flush’ here. Using top quality products supplied by Fernox. Who are an international leading brand in water treatment. These products also have the added benefit of PH neutral and Non toxic, meaning there is no harm to the environment. A-Rated Powerflush are proud to be a member of the Mid Yorkshire Chamber of Commerce. Find us in the Yellow Pages, Facebook & Twitter. We have also been featured in the Wakefield Express. 1. CAN POWERFLUSHING HARM MY BOILER/SYSTEM? No, by PowerFlushing the boiler and system you can enhance the efficiency and increase the life expectancy of your central heating system. 2. HOW DO I KNOW IF A POWERFLUSH IS RIGHT FOR ME? The first signs, Cold spots on your radiators commonly at the bottom in the middle. Black/orange water can be found when bleeding radiators. Excessive noise from the boiler or the heating system pump. Slow warming of the heating system. For your peace of mind, we offer a FREE thermal imaging and water test just to make sure a Power Flush is right for you. 3. WHAT IS THE MAIN BENEFIT OF HAVING A POWER FLUSH? Your central heating system will reach its maximum efficiency, your house will become warmer quicker. Therefore, reducing your heating bills by up to 15%! 4. HOW LONG DOES A POWER FLUSH TAKE? 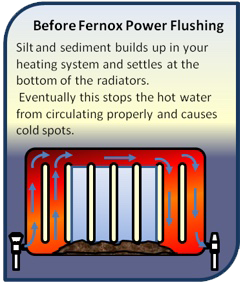 A Power Flush, done correctly, should take a full day (average 7-9 radiators). Excellent and efficient service. Left the house very clean afterwards. I can't fault Matthew at all, he was clean and tidy and did a really good job. The work has made a lot of difference to the house and the heating. I would 100% recommend him. We have many other Testimonials from satisfied customers. View more here. If you have any questions, would like some advice or a free no obligation quote, don’t hesitate to ask, we are here to help.